India won this test match by an inning and 262 runs. Ind 474 1st inning, Afg 109/10 1st inning, flown 109/10 in 38.4 over. It may be possible India will all-out Afghanistan 2 times in one day. Today India's players played like ODI match India vs Afghanistan test match started today at M Chinnaswamy Stadium Bengaluru at 9:30 pm. Virat Kohli was not available for this match so Ajinkya Rahane is captain for this only test match. There are many facts related to this match for players and teams also. Dinesh Kartik is playing his first test since 2010 and Mujeeb Ur Rahman becomes first player playing test match born in the 21st century. Before stump, India scored 347 for the loss of 6 wickets. 1st day Shikhar Dhawan and Murli Vijay played the great innings. Both the players got the century. 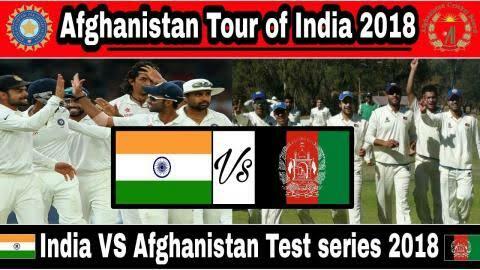 India won the toss in India vs Afghanistan only test match and opt to bat first. Shikhar Dhawan and Murli Vijay started the inning for India. Both players played very well. Shikhar Dhawan played blasting inning like t20 match and scored 107 of 96 delivery with 19 4s and 3 6s on other hands Murli Vijay scored 105 of 153 delivery with 15 4s and 1 6s. Lokesh Rahul 54, Cheteswar Pujara 35 and Rahane scored 10 runs. D Kartik scored only 4 runs faced 22 delivery. Hardik Pandya 10 and R Aswin 7 still on the bat for next day. Yamin Ahadzai bowled very well got 2 wickets in his 13 overs session with 6 M and 32 runs. Rasid Khan 1 wicket of 120 runs in 26 overs. Wafadar and Mujeeb Ur Rahman got 1-1 wicket each. Ist 2 session was in favor of India but last was in favor of Afghanistan.